Weather and landscapes changes at Hemkund Sahib very rapidly. 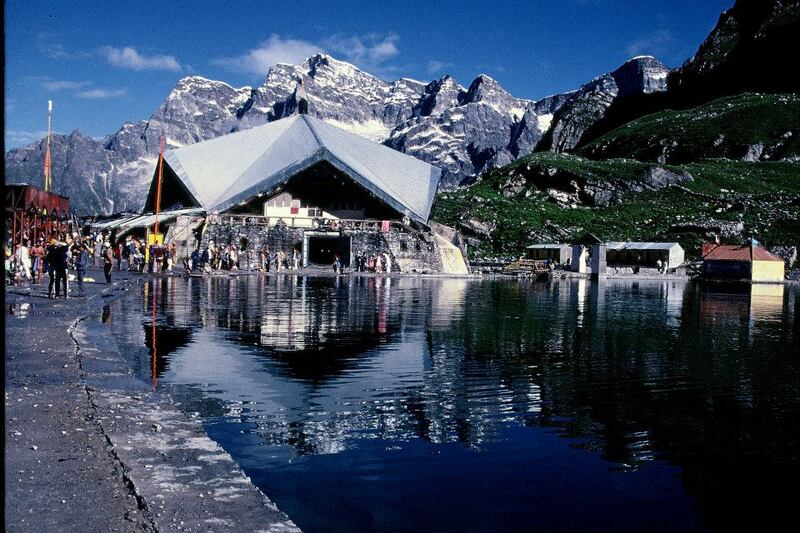 The best time to visit Hemkund Sahib depends upon your taste and priorities. 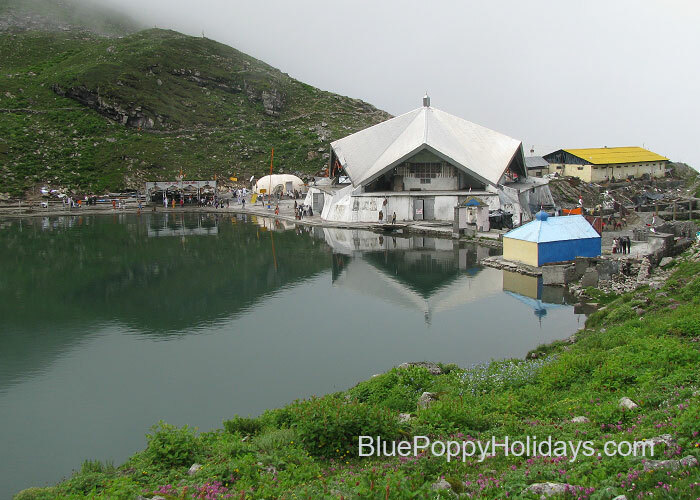 In following paragraphs we will describe how Hemkund Sahib looks in different seasons. Hemkund Sahib in May to Mid June. 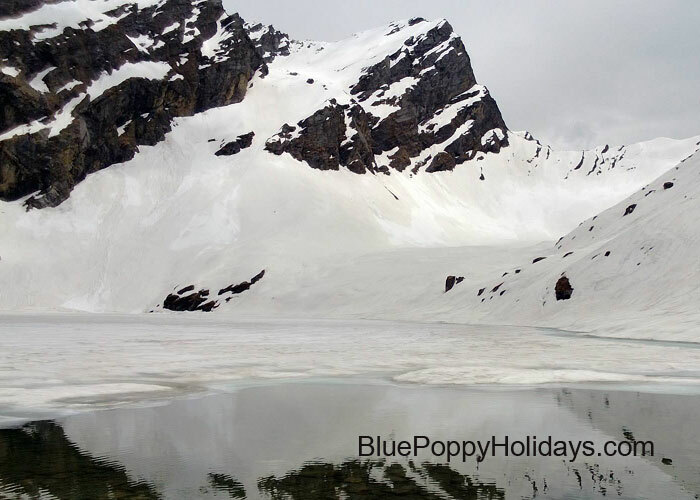 Hemkund Sahib is snow clad for at least 8 months in a year from October to May. 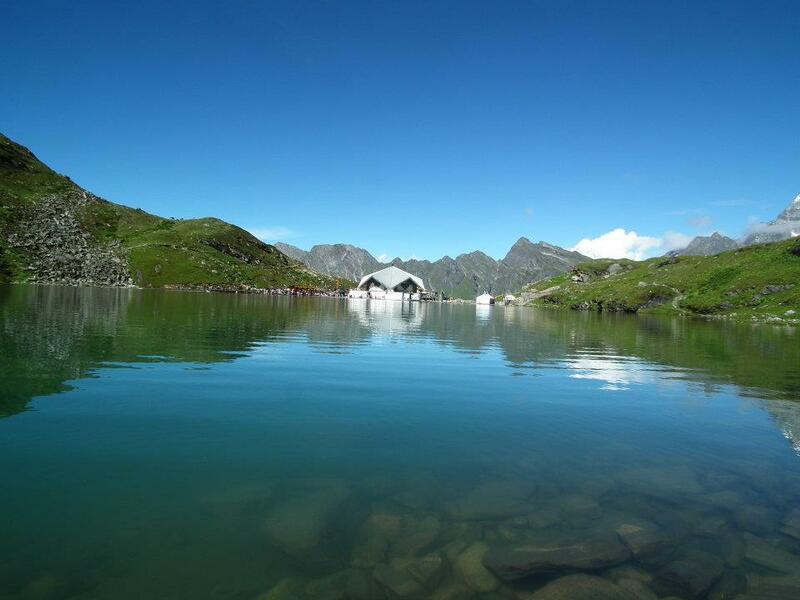 Hemkund Sahib opens for public from 1st June every year and closes on 4th October. But after the floods in 2013 the opening and closing dates may vary. 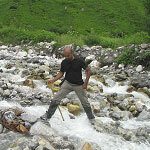 In the month of May last three kilometer trek from Ghangaria to Hemkund Sahib in full of snow. Indian Army clears the trek for pilgrims you will not find any vegetation in the last three kilometer of the trek. 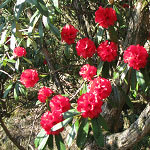 Some beautiful flowers can be seen near Ghangaria and first three kilometer of the trek. Following are some of the pictures taken during mid may to mid June. 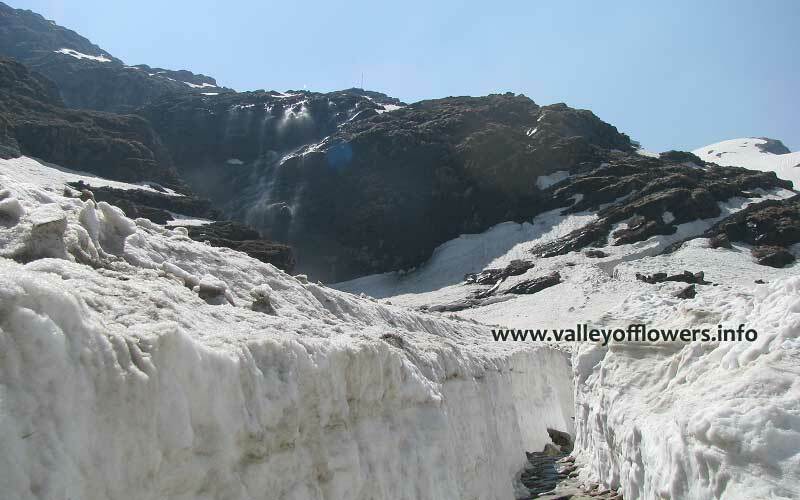 Snow fall on the way to Hemkund Sahib in the month of June. 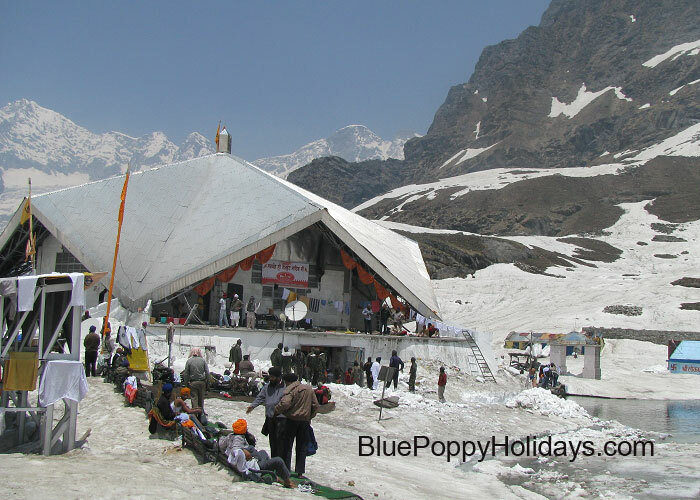 Hemkund Sahin Gurudwara in the month of June. During this time Ghangaria is full of pilgrims visiting Hemkund Sahib. You will find the area too much crowded. If you want to club Hemkund Sahib with Valley of Flowers this is the time you will see very less number of flowers but huge glaciers can be seen everywhere. The weather will be very pleasant and generally it does not rain during this period. After mid June the snow melts very rapidly and new flowering plants come up. Some early flowers can also be seen. Following are some of the pictures clicked during mid June to mid July. If you are combining trip to Hemkund Sahib with Valley of Flowers (which you should) this is a good time as you can see flowers as well as glaciers. 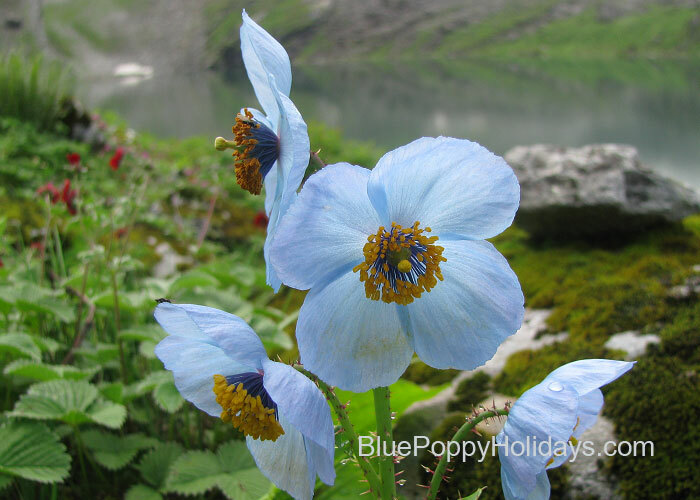 During mid July to end of August Hemkund Sahib is full of flowers and the most prominent are Brahamkamal, Blue Poppy, Bistorta and Vajardanti (Potentilla). All of them look very beautiful. 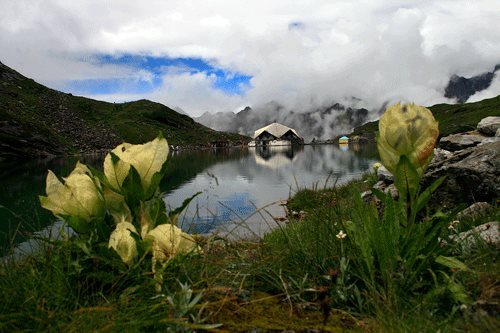 Following are some of the pictures taken at Hemkund Sahib during July and August. By September monsoon is generally over and you can see clear sky and snow clad peaks from Hemkund Sahib. Even Neelkanth Peak is visible from Hemkund Sahib. Brahamkamal flowers are in full bloom and their color is more yellowish. Most of the other verity of flowers goes off as end of September approaches. Following are the pictures taken during the month of September. The month of June is appropriate to visit Hemkund Sahib along with family, although it’s a tad bit crowded at this time being the peak. There wont be any snow, but you will be able to see glaciers along the way to Hemkund Sahib. Please refer Minimum age to visit Valley of Flowers, Whether kids can be taken for Valley of Flowers trek. Planning to visit Hemkund sahib by mid June 2018 by my car. is it a right time to come and traveling by my car ?and how are the hotels there for stay?how many days u recommend to stay to see local sightseeing? Its ok to come by car for the trip. You will need approximately one week for the trip. I am planning to visit hemkund Sahib in the last week of August with my grown up family. Could you advice if it is good time for visiting without heavy rainfall? Itinerary, we are planning on going to the second week of October & just want to ask we are traveling with our 5year old son so oxygen level of Hemkund sahib will be enough for him …I read somewhere that it’s open until October 10th this year…but no other sure if that’ll stay like that. Hi Devkant. 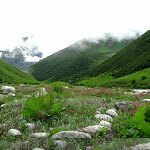 I am planning to visit Valley of Flowers and Hemkund sahib in September 1st week. Could you please mail me the required itinerary. The required itinerary is mailed to you. I M planning to visit valley of follower with wife and 1 yr baby.. Plz tell advice. kindly read ourMinimum age to visit Valley of Flowers, Whether kids can be taken for Valley of Flowers trek. 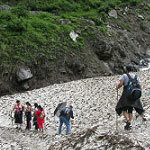 Can you please tell me the basic essentials for hemkund sahib trek. We are two and planning to visit it on 1 july. I’m kishor planning to visit Devbhoomi. two years back i’m trapped with flood in rishikesh they not allowed to visit there, so wanna try again 2018. 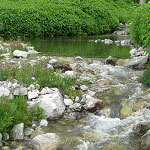 Can you please tell which time is best for to visit hemkund and also chardham yathra, looking for some green season. Best time for Chardham is May June and September, but for Valley of Flowers is July and August. So I dont recommend you to club them. Planning to visit from july 8 to 14 including hemkund Valley of Flowers badrinath and mana village. Brahma Kamal is found in August month. But plucking of flowers is not allowed and is not ethical to do so. Itinerary, we are planning on going to the first week of October…I read somewhere that it’s open until October 10th this year…but no other sure if that’ll stay like that. Also the Valley of Flowers when is the best time to visit there….I have seen photos of flowers in full bloom in the valley to there not being much….I’m guessing spring is the best time for getting the best experience right? Can I plan to visit Hemkund 17th October to 22nd Oct? Sorry, Hemkund sabib is closed in October. It closes on 4th October. We are planning to take a 2year old kid with us during Aug 2nd week 2017. Is it advisable? No madam, please check Minimum age to visit Valley of Flowers, Whether kids can be taken for Valley of Flowers trek. I am planning to visit hemkund and Valley of Flowers during end of july…will there be any sights of snow covered mountains or on roads? And is it an exciting trek? You will see glaciers at Hemkund Sahib and may be in deeper parts of the Valley of Flowers, There will not be snow on the roads. Yes you will see lot of snow on the peaks. Hi! When does the trek open this year? We are planning for June, if you could share some details. The official opening date is 1st June. For more confirmation you can talk to DFO Joshimath. I would like to come next year. Can you tell me the latest date I can come and also what may and June are like? Also is there any assistance for my mother who might not be able to walk the entire way? Also is it okay to take babies or can we wait somewhere – maybe in Valley of Flowers? What’s best time to see Valley of Flowers? Thanks for the inquiry, please contact us in December for best discounts. Please visit Minimum age to visit Valley of Flowers, Whether kids can be taken for Valley of Flowers trek. and Best Time to Visit Valley of Flowers. We are planning to visit in August. Is there any possibility if you could let us know how to get there from Delhi and any hotel accomodations we should look for. My parents are elederly, is it okay for me to bring them along. Contact us in case of any further query. Hi we are 2 people who want to come in September. Your support will be highly appreciated. Glad to see your enthusiasm for the trip. The detailed itinerary for the same has been sent to you. Kindly have a look. I want visit in February second week. How will be the place ? Do you have any idea.? I would like to inform you that Valley of Flowers and Hemkund Sahib gets open on 1st June till the initial days of October. You can come during any time in between. A visit in February is not feasible. Would it be possible to advise some information on Hemkund Sahib as well as the Valley of Flowers? A friend and I would like to visit, but also want to make sure India is not too hot during non-Hemkund visit. From what I noticed .. the best time might be end-August and early September. Are their tours from Delhi that are all inclusive? or partial tours? How far can one drive if one rents a car, and how far is it to it from Delhi .. with easy driving? Are accommodations easily available and would you know the costs etc.? We an stand high temperatures as well as freezing but prefer to go when it is comfortable all around. The itinerary for this year has been sent to you. Kindly check with your mail. It contains all the information. Your questions are also duely answered via mail. We shall take the process ahead with you. I want to visit the place in between period of 15 to 25th of may.Please advice. 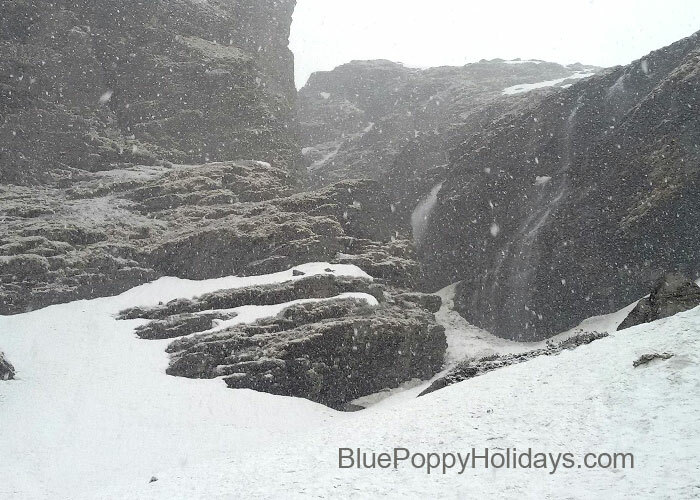 This is to inform you that Valley of Flowers doesn’t open in May. It opens from 1st June to initial days of October. Our Departures starts from 11th June this year. You can join us. The detailed itinerary has been sent to you. Kindly check. What would weather be like ? Where is the base and how long to get to Hemkund ? If one can’t walk is there assistance ? This year’s itinerary has been sent to you. Kindly check your mail. It contains every information. The itinerary for this year has been sent to you. Kindly have a look. I am planning for hemkund sahib and vof on 8/9/2016. What are your suggestions on weather and suggested itineary. Should we go to hemkund sahib on 10 August-15 August. Thank you very much for providing such a nice piece of information. I am planning to visit Hemkund sahib & Valley of Flowers this year in the last week of September . Please provide me necessary information in this regard specially how to cover both the places conveniently. This year’s itinerary has been sent to you. Kindly check with mail. You are helping those who intend to visit hemkund sahib & Valley of Flowers , it’s very thankful job . I shall visit hemkund & Valley of Flowers this year in the last week of september . Pl. provide me necessary information in this regard and oblige . The detailed itinerary has been mailed to you. Kindly check. Hello sir we are going in next 2-3 days hemkund Sahib & badrinath… Pls help us. This year’s itinerary has been sent to you. Kindly check. 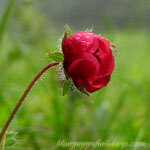 Hi, I & my fiends are planning to visit Hemkund Sahib & Valley of Flowers in the week of 17th Jul till 23rd Jul. Pls advise if it is a good time to visit. How much would be the rains? Also, we are planning to visit Badrinath too during this week. This is good time to visit valley. It rains mostly during night there. We have sent you a detailed itinerary, that included all the information. Hi, can you send me the detailed itinerary as well? Flowering is early this year. A detailed itinerary is sent to you, kindly check. I heard Hemkund Sahib’s closing date is the 10th October. But somebody said to me, the closing date is the 5th of October. Which of these dates are correct? Every year the opening and closing date is decided by the Gurudwara Authorities. Please contact them. I am planning to visit Hemkund Sahib from 18th June to 25th June. We are family of 4 people. We will start from Chandigarh on 18th June and will reach Govind Ghat on 19th June. Is this the right time to visit? As I saw moderate rain forcast on Internet. Also please suggest some good hotels at Govind Ghat and Govind Dham. This is good time to visit Hemkund Sahib. Please go ahead, There are many hotels available in Govindgaht and Ghangaria. This is good time to visit Hemkund Sahib. Please go ahead, There are mnay hotels available in Govindgaht and Ghangaria. We are tour operator exclusively for Valley, Hemkund Sahib and near by areas. You will get to see flowering there at end of August. We also sent you an itinerary. Please check. 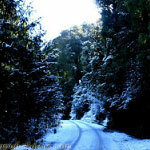 What is the approximate weather in early sept – How cold in the evenings and mornings? I’m intrested in the trek but the only problem is I will be travelling abroad from 25th July to 18th Aug 2016.Can you please suggest me shall I plan the trip before 25th July or after 18th Aug.I really want to see the maximum flowers.Can you please guide me a little. We have already mailed the answer for your queries. Please check. also i would like to know how to reach hemkund sahib and Valley of Flowers ? we will need a local guide or is the trek well drawn out and we can trek on our own? The trek is well defined, you can do it of your own. we are planning to trek hemkund sahib in 1st or 2nd week of july this year. will the weather be conducive enough and how about rains? also other than hemkund sahib and Valley of Flowers, is there any other site around it we can visit esp snow clad? It will be monsoon season in July first week. You can visit Auli and Gorson top. 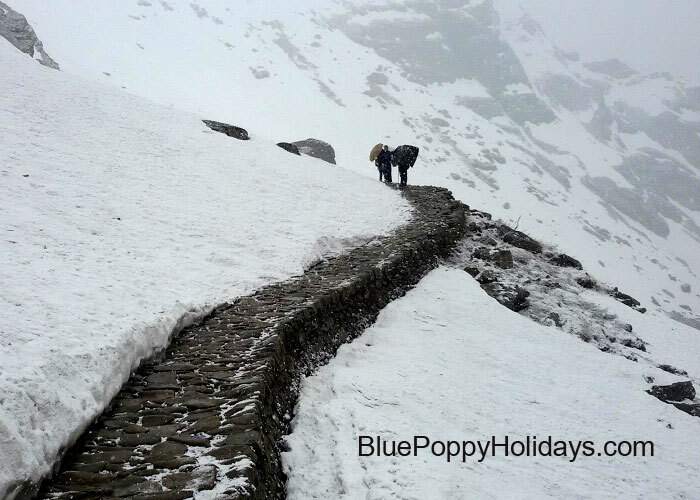 Unfortunately there was very less snow fall this season, you will get some snow at Hemkund Shahib. Planning to visit Badrinath May last week. Is this also possible to visit Hemkunt Sahib and Valley of Flower then? I find that Hemkunt Sahib is also opens from 1st June. Is it open last week of May? Yes sir, It will open on 25th may. You can visit before but u can nly do darshan but guru granth sahib wil be placed up on 25th May 2016.. I am planning a cycling trip from Haridwar to Gobindghat and trekking to Hemkunt Sahib and Valley of Flowers and river rafting at Rishikesh. Which time you think will be good for all these. River rafting is not allowed in July and August, Please check whether they allow in September. You should come in August second half when monsoon slows down and still flowers are available. Hi there, my mother and I are planning to visit hemkund sahib this year (2016). Can you please give me approx weather conditions/temperature in September based on 2015 data. Thank you for the beautiful pictures. I can wait to be there this year. The temperature at Hemkund Sahib will be approx 4-5 degree Celsius during day time in September. You are not allowed to stay overnight at Hemkund Sahib. 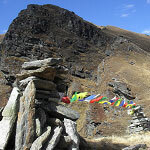 The temperature at Ghangaria will be 4-5 degree Celsius in the evening and night time. You will need thermals. Planning to visit this year hopefully.. Been thinking for 2 yrs but due to flood damage it didn’t work out. What’s the best route ex delhi for Valley of Flowers? How rigorous is the trek in Aug? A detailed itinerary has been sent to you, please check it and revert. I want to visit Valley of Flowers and looking to avoid rush of hemkund sahib. Which is the best season for that? You can plan it for august. A detailed itinerary has been sent to you. Lovely lovely pictures. Make me pack my bags and set out for the journey at once. But alas ! At present I can’t leave for the above journey. But I shall go again, that is for sure. 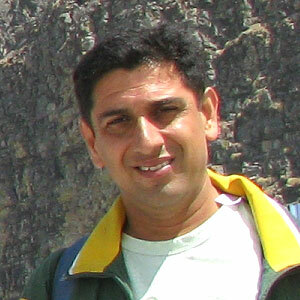 I visited Shri Hemkund Sahib in the year 2007. Please do share your pictures with me, I will be glad to publish them here under your name. 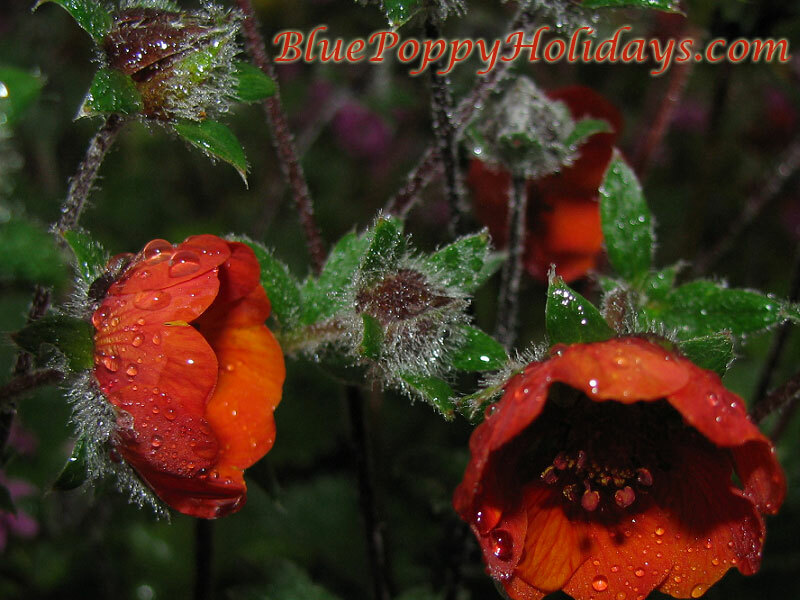 hows it will be if we visit in the last of june to Valley of Flowers. Does we see flowers at this time. Thanks for the complements, Its due again for you and Upinder Ji, Come to Valley of Flowers in 2015. Yes, it may be somewhat better than the Valley of Flowers especially due to the easy availability and visibility of Brahma Kamal in the months of July & August. Yes, Also Bistorta Afinis also looks very nice and found in good number of colonies.